Up until a year ago, we had never installed wallpaper ourselves. The job always seemed daunting. More specifically, figuring out how to apply wallpaper around a corner and have the patterns match up seemed daunting. And so, we always hired professionals to do the job. 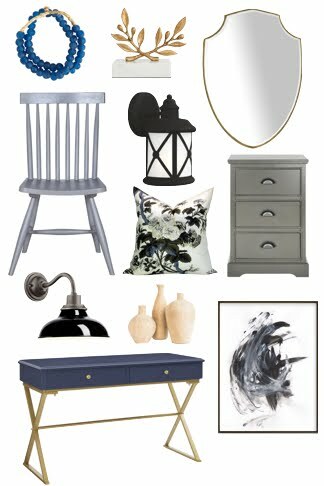 But then last spring we decided to tackle hanging the wallpaper in my feminine home office ourselves and we haven't looked back! We've hung wallpaper four times now and the wallpaper in our dining room was the easiest job yet. Measure the length of wallpaper required. Add 2" to this measurement. Measure the width of wallpaper required. Measure from the last full panel of wallpaper to the corner. As corners are rarely square, measure at the top, middle and bottom. Add 1/8" to the widest measurement. Cut a strip of wallpaper the required length and width. Do not discard the 'off-cut' piece; you will use this on the other wall. Apply paste to the wall. (Note: if your paper is the Paste the Paper kind, you will need to paste and book the paper instead). Apply the first strip of paper. Trim at the top and bottom. 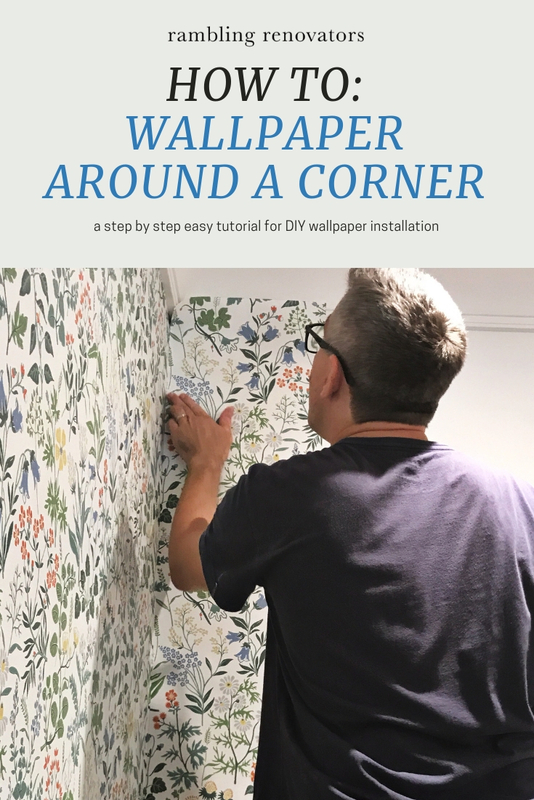 This first strip will overlap your corner by about 1/8"
Minimize the overlap by taking your smoothing tool and placing it up into the corner and flat against the wallpaper strip. With a very sharp utility knife on the outside of the smoothing tool, run the smoothing tool down the wall from top to bottom and cut as you move along. Carefully remove the excess overlap. As you won't be able to match the off-cut piece exactly as some of the pattern has been cut away, you'll need to create a horizontal reference line on the next wall to help with pattern matching. To do this, go to a full panel of wallpaper and pick a reference item, say a flower at the top of the panel. Measure how far down that pattern falls from the ceiling. Take that measurement and draw a long horizontal line on the second wall. You'll also need to draw a vertical reference line to ensure your off-cut panel is level. Measure the width of your off-cut piece. Draw a level line at that width down the length of the wall. Apply seam adhesive to the outside edge of your first piece of wallpaper. This adhesive ensures that when the off-cut is affixed on top of that overlap, the edges won't curl or come apart. Affix the off-cut piece, using the horizontal and vertical lines to ensure your patterns line up and the piece is level. Whew! That's a LOT of information to process. 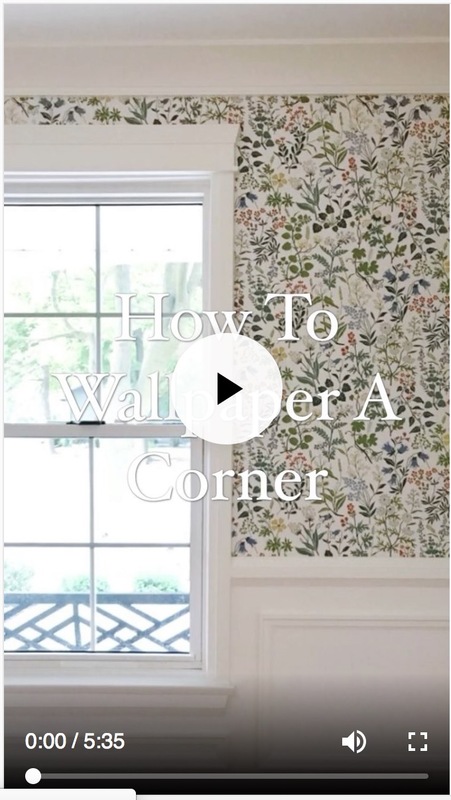 To make it easier, I've put this video tutorial "How To Wallpaper A Corner" on my IGTV channel. Give it a watch and hopefully the steps are clearer.